posted by Brian Hillabush in basketball, sports, elba. The Elba girls basketball team had an off year last season, losing seven games and only making it to the sectional semifinals. But the Lancers beat rival Notre Dame to make those finals, and return a lot of players from that squad in addition to some new faces that make this one of the most athletic and deep Elba teams in years. Seniors Katie Newton and Julie Webster and juniors Julie Marshall and Chelsie Pangrazio all have varsity experience and will all get plenty of playing time as coach Tom Nowak intends on pressing hard and playing everybody on the roster. But possibly the two biggest names on Elba's roster heading into the season were not on the team last year. Senior guard Sarah Schwartzmeyer was a star on varsity as a sophomore, with the ability to score, rebound, pass and play defense. But she took a year away from the game to work on her softball skills. She is one of the top pitchers in Section 5. She returns and immediately steps into a leadership role. She will be relied upon to score and maintain the flow of the game. The other different face is Missy Call. Call is a junior this year, but got a ton of experience playing on the Oakfield-Alabama varsity team last season. She can shoot the ball, play defense and is a good distributor of the ball. There are a few youngsters up on the varsity squad that will also make an impact. Sophomore guard Cassy Engle, freshman Meg Stucko and eighth-grader McKenzie Bezon should all provide sparks this season. Both Notre Dame and Elba had off years last season, but both are back up this year, and the Dec. 16 and Feb 10 games are highly anticipated games on the GR schedule. posted by Philip Anselmo in video, elba, byron, Elba Mucklands, dairy princess, cooking, recipes, onion. Here it is: Episode four in our series Cooking with the Dairy Princess. In this episode, your favorite princess and mine, Anika Zuber, is welcomed by a speical guest. Enjoy! Don't forget! You can visit The Batavian at Blip.tv to see this video in large format, as well as many of our other videos. Simply go to The Batavian's video channel at: thebatavian.blip.tv. posted by Brian Hillabush in batavia, basketball, sports, elba. The Genesee Region League has some quality basketball, but typically stuggles in the sectional playoffs (with the exception of Notre Dame in Class D). There is proof of that when you look at the results from last season, when Elba was the only team to make the finals where they lost to Fillmore 53-43. Batavia also made the finals in Class A, playing in the Monroe County League during the season. As teams have started practice this week, we are looking at a season in which the GR has the potential to make some noise down the road. Oakfield-Alabama and Pembroke are expected to be two of the favorites, but are going to have some tough teams to battle in the larger of the C classes, including East Rochester, Gananda, Avon and Cal-Mum. Alexander and Kendall are improved programs that are going to look to surprise people during the regular season, but have to deal with Perry and Lyons (which is usually stronger in basketball than football) in the lower C bracket. Elba and Notre Dame have a very memorable game in Class DD last year and are amongst the favorites again this year. But Genesee Valley and Arkport have had solid teams in the past. There is obviously a long way to go and this should be a great year for GR boys hoops, but it is interesting to see how the classifications break down and imagine the league bringing home a couple of championships. posted by Brian Hillabush in football, sports, elba, byron. I haven't been getting results from Elba/Byron-Bergen's football squad since the Pool Play started, but I did find a story on the semifinals win over Bolivar-Richburg on Saturday. Elba/B-B did lose in the finals, but had a successful run, winning three games in a row before this. posted by Brian Hillabush in sports, elba, byron, alexander. The Trojans are looking to end the year on a positive note. 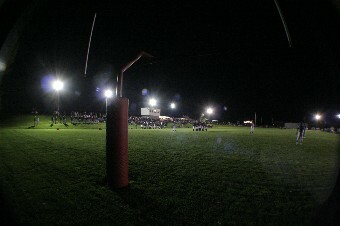 They lost to Canisteo-Greenwood in the opening round of the playoffs before beating Red Jacket 31-20 last weekend. Jay Schafer leads the squad with 779 yards and seven touchdowns on the ground. The Raiders are led by Greg Brown. The Lancers won for the second consecutive week, beating Warsaw 19-12 in a Pool Play game. Zach Green has been putting up big numbers all year and they've gotten insane in recent weeks. He ran for 205 yards with three touchdowns last week. 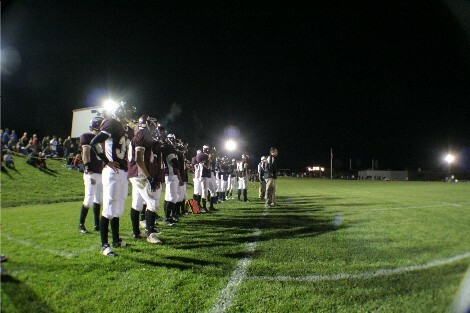 The Elba/Byron-Bergen football won for the second consecutive time, downing Warsaw in a Pool Play game, 19-12. The Lancers were down 12-0 midway through the third quarter but stormed back with two third quarter scores and another in the fourth. Zack Green had another monster game with 26 carries for 205 yards and three TDS and Cody Torpey completed 2-of-2 pass attempts for 34 yards. He also made 10 tackles. Warsaw falls to 0-8 while Elba/Byron-Bergen improves to 3-5.
posted by Howard B. Owens in elba, bill kauffman, Lucine Kauffman. Here's an MP3 of a radio station interview with Bill Kauffman about his book on Luther Martin. A little outdated, but I just found this article by Bill in The American Conservative on last month's "Bill Kauffman Day" at Dwyer Stadium. Then there is the more recent TAC column about Lucine Kauffman, town supervisor of Elba. (to follow that link, you need to sign up or a temporary free account -- pretty painless -- and then be able to download the PDF). The Republicans are indulgent of Lucine’s non-Republican husband, but then in a healthy society politics plays so small a role in our lives that who really gives a damn how others vote? Cold ideologies melt in the warmth of daily communal life. I think of the local civic organizations in which, say, Assembly of God churchgoers and gays work side by side in the cheerful labor of neighbors. They can be friends because they are, to each other, rounded and fully dimensional. They are people, not cartoons. This is nigh impossible in larger places, where such disparate folk would never meet and would exist to each other only on the flat screen of the TV set. Instead of Kate and Dave they would be “Religious Nut!” and “Fag!” How dreary. How lifeless. How very Red and Blue. If you can, read the whole thing -- it's full of Bill's usual wit and fine writing. posted by Brian Hillabush in football, sports, elba, byron, alexander, holley. Guy Hills and his Holley football team are looking to get their first win of the season. It has been a long, difficult struggle but Pool Play is for building for the following year and that's exactly what coach Chad DeRock is looking to do. The Lancers won a much needed game last week, dropping Section 6's Bishop Walsh 34-16. Zach Green continued to impress, gaining 255 yards with two touchdowns in the game. Elba/B-B is looking to build on that victory and get the returning players from Elba and Byron-Bergen confidence heading into the offseason. Barker nearly shocked top-seeded Clyde Savannah in Class DD last week, showing how good the Genesee Region League is, losing 7-6. Greg Brown and his teammates can be proud of that effort, but will be tested against Finney, which was upset by Perry last week in Class D.
The junior-filled Trojans were thrilled after a 3-3 regular season and then disappointed after penalties killed them in a 28-14 loss to Canisteo-Greenwood last week in the opening round of the playoffs. The juniors just want to keep playing and getting better. Elba/Byron-Bergen (1-5) at Bishop Walsh (1-4). Some games are close to a must-win, even if a team isn't going to make the playoffs. Elba/Byron-Bergen has that situation this weekend as Walsh is not a very good football team that could be the home underdog. The Eagles have only scored 66 points in five games, while giving up a whopping 187. The Section 6 school is coming off a 43-12 beat-down at the hands of C.G. 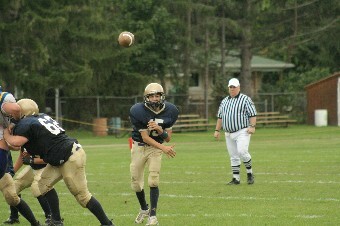 Finney last week and has only beaten Niagara Catholic this season in a 26-22 game. The Lancers need a win in this game to quiet some of the many critics that are not happy with the way the program is going. Last week's 48-14 loss to Notre Dame was rough to look at on the field, but the reason isn't because of the skill of the players. The Elba/Byron-Bergen penalty count - including personal fouls - is out of control and the fans have grown impatient with the losing and penalties; and they are becoming very vocal. When the team doesn't turn the ball over or shoot itself in the foot with the penalties, they are competitive. Zach Green is one of the more talented athletes in the Genesee Region League and people will remember him as the biggest bright spot for this team, this year. He gained the majority of Elba/Byron-Bergen's 129 rushing yards last week and can break off a big run at any time. Brandon Spurling also has that breakaway ability and will get his share of carries. The Lancers had been starting Eric Kowalik at quarterback for most of the season, but switched back to Cody Torpey last week. It is unclear at this point as to which one will get the start or the bulk of the plays behind center this week. The Byron-Bergen players have improved throughout the season and have now gained enough varsity experience to play with a team like Walsh. The Lancers are looking to win this game and try to turn some of the negative talk into positives heading into Pool Play. After some consideration, I've decided to bring the current situation in Elba to the sports tab of The Batavian. I was one that figured that football merger with Elba and Byron-Bergen was going to improve the situation, but at this point I don't see people in Elba giving this a fair chance. This thread on Section 5 Talksback really brings up a lot of concerns, true or not. I've been hearing about players taking cheap shots at other players since I was a kid watching football for the first time. But some of the accusations made in this thread are pretty serious. YES. This is exactly what happened. Zambito scored twice and had a very nice game against his former team. On his first touchdown an elba player got flagged for a blatant late hit on him. All throughout the game it was pretty obvious they were gunning for him not only during play (which is fine) but after the whistle had blown (which is not). The announcers on the radio even brought up the point of elba going after Zambito in an unsportsmanlike way. But I cant even place most of the blame on the players for this, the true reason is utterly disgusting. The ND chain gang on the elba bb sideline overheard elba's head coach offering $5 to whoever hurt Zambito and took him out of the game. I think that right there says enough about the class act elba has leading its program. DISGUSTING. Remember that posters are anonymous, but if you get into reading that thread, your stomach is going to churn a little bit as everybody involved (players, coaches, parents, school administrators) have to hate that these kind of topics are not going away. I was at the game on Saturday and I admit that the situation was pretty ugly on the field. When Gianni Zambito - a former Elba student - scored his first touchdown, there was a late hit and personal foul call issued. I know that there were several occasions when near-fights were broken up on the field, and a lot of it brings back the ugliness of the Joe Zambito firing of three years ago. At the start of the season, it looked as if the merger was great for both schools and all of the kids, but the negativity isn't going away. In fact, it isn't even slowing. I like Elba/B-B coach Streb and I'm not going to believe some of the ugly rumors being floated out there until I hear something like that myself. In fact, I feel for the coach as he walked into an impossible situation that isn't getting any easier for him. High school athletics is all about the kids, and somehow Elba/Byron-Bergen football has to get back to being about the kids on the field, playing a great game. 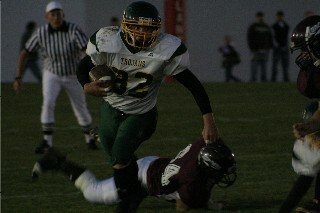 posted by Brian Hillabush in football, sports, elba, byron, Notre Dame. The Notre Dame football team is ready for playoff action. The Fighting Irish wrapped up their regular season with a 48-14 win over visiting Elba/Byron-Bergen Saturday afternoon, and were nearly perfect in doing so. The victory clinches a home playoff game in the first round of the Class D playoffs next Saturday, where ND will either be a No. 3 or No. 4 seed. While Saturday's results were ugly, both on the field and off of it, Notre Dame's players are ready to go. They compiled 369 rushing yards compared to Elba/Byron-Bergen's 129. Kevin Schildwaster racked up 129 yards and two scores on just eight carries and Mike Pratt added 92 yards on 14 carries. Greg Barr finished with 12 carries for 58 yards with a TD and Gianni Zambito had four carries for 24 yards and two scores. The Fighting Irish didn't pass the ball in the second half because of the blowout, but Nick Bochicchio had a solid effort, going 6-of-8 for 102 yards and a touchdown. Kevin Francis had that TD and caught four passes for 69 yards. The Lancers actually opened the game with a touchdown on a great play. Elba/B-B made the surprising switch at starting QB from Eric Kowalik - who had been the starter for the past month - to Cody Torpey, who started at the beginning of the season. Torpey had a nice game as signal-caller and kicked off the game's scoring with a 44-yard TD strike to 6-foot-6 receiver David Garnish, who made a finger-tip catch. The Lancers could be looking in the senior's direction more as the regular season wraps up. Notre Dame got a 29-yard kickoff return from Zambito for solid starting field position on its opening drive. The 1:30 drive which started at midfield ended up leading to a 7-7 tie midway through the opening frame when Bochicchio pitched a ball up for Francis, who jumped over a defender to haul it in before jolting a few more yards to the end zone. After Pratt recovered an Elba/B-B fumble, Notre Dame was back in business at the Lancer 7-yard line. Schildwaster took it in from 7-yards out for the go-ahead less than a minute after the Irish had last scored. The faked extra point led to a two-point conversion pass from Schildwaster to Greg Barr. Schildwaster later broke off a 48-yarder to set up a Beau Richter 1-yard TD run that gave ND a 22-7 lead after the opening frame. After an Elba/Byron-Bergen punt, Bochicchio hooked up with Francis on a 29-yard pass to set up another Schildwaster TD run, this time for 10 yards. The Lancers failed to move the ball again and failed to convert on a fourth-and-6 at their own 44. Bochicchio hooked up with Rick Lair on a 27-yard pass inside the 5-yard line. Zambito scored on a 3-yard touchdown run, and this is when the game got ugly. There was a personal foul called for a late hit after Zambito - who attended Elba before transferring to ND this year - scored. Another penalty was issued as players were nearly ejected and some of the Elba/B-B fans started getting on the officials. It was an ugly first half for the Lancers, who had six penalties for 84 yards. The score was 34-7 at the half. The Fighting Irish received the second half kickoff and marched 67 yards over nearly 10 minutes, with Barr scoring on a 1-yard run. The score remained 41-7 through three periods of play, but an unnecessary roughness call against the Lancers on a punt play pushed them deep into their own territory with another punt on the way. The kick made it out to the Elba/B-B 40, and Pratt took it back to the 32. Zambito scored a few plays later on a 10-yard scamper to finish up Notre Dame's scoring. The Lancers tacked on a late touchdown with Zach Green ripping off a 67 yard touchdown run with seven minutes left in the contest. Elba/Byron-Bergen falls to 1-5 and is most likely eliminated from the Section 5 Class C playoffs, and will be in Pool Play. Notre Dame is now 4-2 and will kick off the Class D playoffs on Saturday at home. posted by Howard B. Owens in elba. If you have news about Elba to share, tag your post "Elba" and it will appear on this page. More help here. posted by Brian Hillabush in batavia, football, sports, elba, byron, Notre Dame. The Fighting Irish are currently the No. 4 seed in Class D and will be looking to get things in order to start a sectional run next week. A loss would mean Notre Dame would lose a home game in the first round as they would probably move down to No. 5. Notre Dame is doing it all on the offensive side of the ball. Nick Bochicchio has over 500 yards passing and is getting better every week and he has a great target in Kevin Francis at wide receiver. Bochicchio has the luxury of having a good running game to go with the passing attack. Kevin Schildwaster had his best week of the season in last week's win over Holley and now has 358 rushing yards with five touchdowns. Mike Pratt has 348 yards and five TDs. You never know what you are going to get from the Fighting Irish on offense. The Lancers have had some serious struggles this season as the Byron-Bergen kids are still learning how to play the game. But there have been some signs of potential. 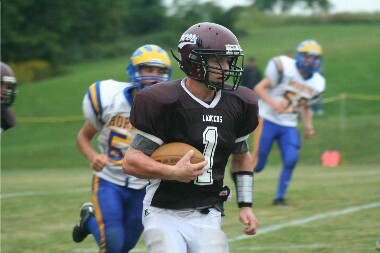 Zach Green has become a star in the Elba/Byron-Bergen backfield and he gets plenty of help from Brandon Spurling. The Lancers like to throw the ball around a little bit with quarterback Eric Kowalik and have the potential to do big things with Cody Torpey, who will line up at receiver, running back and quarterback. Elba/Byron-Bergen is on the outside looking in when it comes to sectionals at this point. The Lancers are the No. 9 seed in Class C and a win on Saturday would be a big help if they want to get that eighth seed and the fun first round matchup against either Le Roy, Oakfield-Alabama or Pembroke. posted by Brian Hillabush in sports, elba, pembroke, soccer. There is a very interesting race going on in Genesee Region League girls soccer. There is a three-way race for the goal scoring title and a two-way race for the goal scoring title. It is mixed with players from Division I and II. Wheatland-Chili's Lauren Drago has 20 goals and 12 assists, for 52 points to lead Division II. The Wildcats are currently 9-2 and lead Division II. Elba is second at 6-3-2. W-C is the most potent scoring team in the division as Taylor Smith is third in the division with 13 goals and eight assists for 34 points. Carrie Grande is fourth with eight goals and nine helpers, for 25 points. Drago is currently one goal behind Pembroke's Nicole Sharick for the goal scoring title. Sharick leads all GR scorers with 21 goals, but has nine assists and is at 51 total points, one behind Drago. The Dragons are in first in Division I with a 9-2-1 record with Alexander in second at 8-3-1. Alexander's leading scorer is Rachel Pettys, who is eighth with seven goals, two assists and 16 points. Byron-Bergen's Stacy Maskell and Holley's Emily Troup are tied for second in scoring with nine goals, three assists and 21 points apiece. Elba's Chelsi Clark is just one goal behind Drago and Sharick with 19. She also has five assists for 43 points. You can check out all of the scoring leaders for Division I here and Division II here. posted by Philip Anselmo in history, video, agriculture, elba, Elba Mucklands. posted by Philip Anselmo in history, video, agriculture, elba, Elba Mucklands, Elba History Barn. Were you able to make out the price of a gallon of gas on the old Esso pump? Ann didn't only tell me about the history barn. She told me a lot more about growing up in Elba and working in the muck fields. Please be sure to check out that video which should go up later this afternoon. posted by Howard B. Owens in batavia, crime, elba, byron. Shaun A. DiSalvo, 30, of Linwood Avenue in Batavia was apprehended Saturday morning at 4:30 a.m. for allegedly operating an ATV while intoxicated and unlawful possession of Marijuana. Batavia officers report they spotted DiSalvo operating the ATV north on Route 98. When they attempted to stop ATV, he initially tried to flee, according to the report. After a brief pursuit, he stopped on South Jackson. He also received citations for operating an ATV on a public highway. Edwin L. Stancliff, 29, of Ocala, Fla., was arrested in Pembroke Thursday at 5:43 p.m. for allegedly operating a motor vehicle while intoxicated. Corfu police officers report they made the arrest after a traffic accident. According to the report, Stancliff was driving without a license and fled from the scene of the crash. Melvin G. Draper, Jr., 27, of Walnut Street in Batavia, was arrested Saturday at 10:19 p.m. after reportedly operating a vehicle involved in a single-car accident that left a female passenger hospitalized with internal injuries. A 15-year-old passenger was uninjured. Draper was charged with aggravated unlicensed operation in the first degree, endangering the welfare of a child, driving while intoxicated, leaving the scene of a personal injury accident and speed not reasonable. The accident occurred with Draper was reportedly operating the vehicle eastbound on Batavia-Elba Townline Road at a high speed on a wet road. Police say Draper lost control of the vehicle and it slid into a ditch and became airborne after hitting a driveway. The report says Draper then left the scene and went to a nearby friend's house. He later returned to the scene. David W. King, Jr., 27, of Lockport Road, Elba, was arrested Friday at 11:28 p.m. for allegedly operating a motor vehicle while impaired by drugs. He was also charged with criminal possession of a controlled substance, speeding and an unsafe lane change. Police report that they found King with a glass crack pipe and crack cocaine. Gordon C. Gonyo, 54, of Byron Road in Byron, was arrested Saturday at 6:37 p.m. for allegedly driving while intoxicated. Gonyo was apprehended after a complaint about a vehicle being operated erratically on Byron Road. 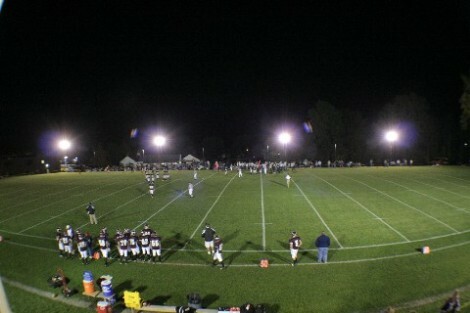 posted by Brian Hillabush in football, sports, elba, alexander, byron-bergen. After losing games to Oakfield-Alabama, Pembroke and Attica, the Alexander football team has found the right equation to win in the Genesee Region League. The Trojans play a physical style of football that involves pounding away with the ball on offense, are attempting to force turnovers on defense and - most importantly - making all the right moves on special teams. Alexander won for the second consecutive week and are now 2-3 after beating Elba/Byron-Bergen 28-13 Saturday night in the first game ever played under the lights in Elba. The Trojans spoiled Elba/Byron-Bergen's homecoming, but it didn't take away from the cool atmosphere of seeing a game in Elba played under lights, which did an excellent job of lighting the middle part of the field. It almost wasn't spoiled as the two teams played a pretty close first half. The two squads exchanged punts on their first possessions and a special teams mistake by Elba/Byron-Bergen on the team's second possession proved costly. The snap sailed over the punters head and the Lancers picked it up and ran to their own 30-yard line. Alexander had a couple of decent running plays before Jay Schaefer ran one in from six yards out. The extra point was missed. 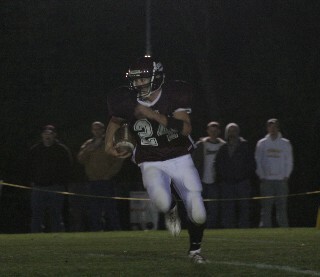 Elba/Byron-Bergen's Zach Green then returned the ensuing kickoff 81 yards for a touchdown. Again, the kick failed and the score was tied at 6 after the first quarter. Alexander coach Dave Radley wanted to make sure I mentioned kicker/punter Lucas Czechowski in my preview this week and for good reason - he came up big. His first big kick was a 22-yard field goal early in the second quarter that put the Trojans up 9-6. Alexander had a long drive to open the second half - aided by some costly Elba/B-B penalties - that led to another Schaefer touchdown, this time from two yards out. The kick made the score 16-6. The Lancers scored on another big play as Green rumbled 61 yards for a TD. The extra point brought Elba/Byron-Bergen to within three points. Alexander marched down the field, going 68 yards down to the Elba/B-B 1 with a long kickoff return and a key pass from Zach Burke to Czechowski. But the Trojans fumbled the ball away and the Lancers took over deep in their own territory near the end of the third quarter. Green broke off a 15-yarder, but the drive stalled and the Lancers had to punt again. For the second time in the game, the snap sailed over the punter's head. This time it went through the end zone for a safety. Alexander got the ball back and was moved into field goal territory because of an Elba/B-B facemask call. Czechowski hit the 22-yard kick to make the score 21-13. Ryan Piechocki had a key sack and forced Elba/B-B into a passing situation where Jordan Leitten took advantage, intercepting a pass at the 20-yard line. Mike Woodrow had a 4-yard run a few plays later to make it a two touchdown game. Leitten capped off the victory with another interception in the closing seconds, allowing the Trojans to take a knee and run out the clock. Elba/Byron-Bergen falls to 1-4 and the biggest crowd to attend a game in the town of Elba in years was treated to a cool homecoming experience. But the team will have to work on limiting penalties and making huge mistakes on special teams if it is going to beat Notre Dame or Bishop Walsh in the final two weeks of the season. Alexander is now 2-3 and will wrap up its regular season with a home game against Barker next Saturday. The Trojans were the No. 4 seed in the Section 5 Class D playoffs before the win and should move up to No. 3 with Avon's loss to Le Roy last night combined with the victory. 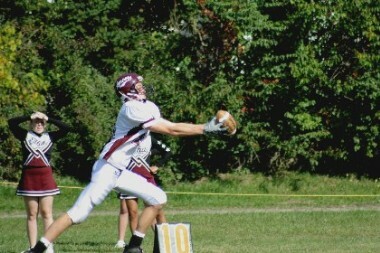 posted by Brian Hillabush in football, sports, elba, byron-bergen. Alexander is young and Elba/Byron-Bergen is learning the game. These two teams have had some early season struggles and are looking to make a late season charge to build on for next year. The Trojans have a squad filled with juniors and started the season with games against the "big three". The team picked up its first win of the season last week with a 9-8 victory over Holley. The star of that game wound up being kicker Lucas Czechowski, who booted a 30-yard field goal to win the game. Czechowski is having a big year as the team's punter as well. The Trojans have have actually made some difficult starting points for opposing offenses because Czechowski is averaging 47 yards per punt. Alexander's defense has been led by Ryan Piechowski, who has 36 solo tackles with six assists. Ryan Wilson has 21 tackles and two sacks with Jordan Leitten leading the secondary with two interceptions. Mike Woodrow has picked off one pass. Jay Schaefer gained 127 yards rushing last week and now has 327 yards and two touchdowns on 41 carries this season. Piechowski has 79 rushing yards and two scores. Elba/Byron-Bergen has been playing its starters throughout the game to help the B-B players get experience, and they have been very competitive against the second teams of Oakfield-Alabama and Pembroke. The Lancers got two touchdowns from Zach Green in the fourth quarter last week and both he and Brandon Spurling are solid runners. posted by Brian Hillabush in baseball, sports, elba. Former Elba student Casey Hoover is in his freshman year at Keuka College, where he is playing on the baseball team. The Storm are currently playing fall scrimmages and there are a couple of videos on YouTube of him getting his first hit and scoring his first run playing college ball.